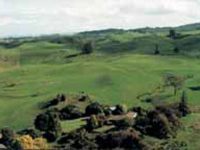 Patrick sends along word that scenes for ‘The Hobbit’ will be filmed this November in the North Island town of Piopio. From Jasons.co.nz: Piopio lies in a picturesque area of native forests and rolling farmlands with rich native and exotic vegetation. The town is located just south of Waitomo and Te Kuiti and is easily accessible to the activities of the region including the Waitomo Caves, rafting, horse trekking and hiking. Sheep and cattle farming are the main industries of the area. From waitomonews.co.nz: IT’S official . . . but no-one can say a word about it. Scenes of The Hobbit – Sir Peter Jackson’s prequel to The Lord of the Rings – will be filmed in the Piopio district. Now the hunt is on to find accommodation for 450 of the two production crews who will be here for three weeks from mid-November filming at the Denize family’s property, Mangaotaki. Some 350 of the crew will here for a week with another 100 staying a fortnight. There will be a crossover period in the middle where all 450 will be in the region. Locals assisting in the search for a range of houses – Nicky Atkinson and Bruce Maunsell – are bound by confidentiality agreements and unable to speak to the media. Accommodation assistant from The Hobbit production team, Andrea Hinchey visited Mrs Atkinson and Mr Maunsell on Monday and is presently in town organising housing. Confirmation the crews were coming was revealed in an email sent by Mrs Atkinson to local residents on Tuesday seeking houses to rent. A range of houses from “top quality, middle range and standard” houses are needed from Mokau to Te Awamutu (if necessary). But, there are conditions. The email states: “Ideally these shooting crews will want somewhere to relax and sleep at night after a busy day. They do not want to have to talk to lots of people at night so B&B-type accommodation in a family home is not what they are looking for. Weekly rental rates will paid and house owners with animals will be able to come back during the day to feed them. Standard accommodation, as close as possible to the Mangaotaki location, is needed for crews who set up and dismantle sets daily. And those offering their houses for rent will need to be flexible as houses may be needed for shorter or longer periods. Ms Hinchey must view all homes offered and will need to schedule times to visit in the next week or so. But just where locals will stay is also part of the equation. Suggestions include erecting a tent city, use of local marae or moving in with family and friends. Skills from locals may also be needed as November draws near. In the past two days residents have rallied quickly and several properties are being assessed for use. The Hobbit will be shot as two movies – the first featuring the novel by JRR Tolkien; the second a transition into The Lord of the Rings trilogy. Many of the cast from The Lord of the Rings return to play their characters from the trilogy for The Hobbit.